There's No Place Like Home: What Day Is It? I am so thankful to live in this country! It is so humbling that people are willing to die for our freedom. I am beyond grateful! We are enjoying the summer! Katie and I have been sleeping until almost 9:00 every morning. And we go to bed way too late. That's my kind of schedule though. And I have had no idea what day it is for the past week. I guess it doesn't really matter? This is the only picture I took all weekend!Kind of sad, huh? 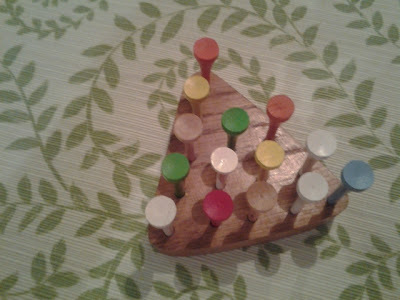 We were at my parent's on Sunday night and I got addicted to this game. You try to jump pegs and just end up with one. It was a challenge. I finally did it after about 100 tries! 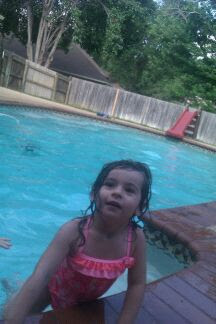 Last night Marcus took Katie swimming at his parent's house and he took this picture for me! I was so glad that Katie was not scared of the water after the pool incident in January. We have her signed up for swimming lessons in a couple of weeks! I got a few spray painting projects done while they were gone. I will have a show and tell soon. Did any of you watch The Bachelorette? And I got some jewelry last week. I plan on putting some things for sale tomorrow! Me Me, I watched. I think the producers are really pulling out all the goofballs to get people to watch. Seems like more weirdos than before. And all the tears and fighting, wow. Makes me love my hubby even more! I hope she finds her happily ever after. Looks like she will have earned it. We have swimming lessons planned this summer, too. I feel so behind having not done them already.